Urban renovation of 22.000 square meters in the centre of the city for residential, commercial and service use including a hotel, wellness centre and a shopping mall. 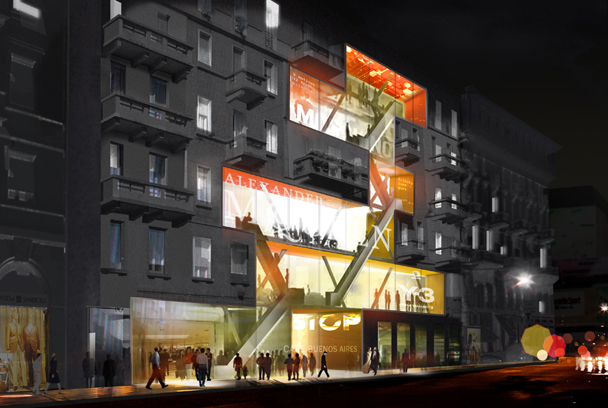 Status: 1st prize, Corso Buenos Aires competition. Corso Buenos Aires is a renowned High Street in Milan where international brands jostle to have their own flagship store. The property in question is made up of four buildings that run the length of an entire block. Due in part to the poor condition of the buildings this part of the street had not been as successful as others. The aim was to make the property more commercially attractive to the big brands and to convert the buildings into a mixed-use site. One of the buildings facing the main road houses a department store with a partially transparent façade framing the busy escalators. Other retailers are grouped to form a covered shopping arcade. More private activities such as a hotel and restaurants are situated towards the inside of the developed area. Private luxury penthouse apartments are located above the department store and one of the old inner buildings is transformed into a striking hotel so creating a space that is constantly in use.